The BOC decision is the main event in the first full week of 2019. Oil prices made a more meaningful recovery, bouncing on reports that Saudi Arabia and other countries cut their exports to the US. However, this may be a demand rather than supply story, which does not bode well for the black gold. Stock markets continued suffering on weak data from China and Apple’s revenue warning stemming from poor sales there. The Canadian Dollar is usually sold off with stocks, but this time was somewhat different. The Fed’s Robert Kaplan sounded dovish about rate hikes and also about the reduction of the Fed’s balance sheet. Also, a poor ISM Manufacturing PMI added to hopes that the Fed may change its policy. The greenback retreated on the news. While stocks continued suffering, USD/CADdropped on the greenback’s weakness and rising petrol prices. The loonie will continue following oil prices, which remain highly volatile. The recent rebound may not last for too long. And there’s quite a bit of action awaiting C$ traders. The Ivey Purchasing Managers’ Index is due on Monday and will probably drop from the healthy levels seen in November and October. Housing Starts are of interest on Wednesday, and the New Housing Price Index is noteworthy on Thursday. 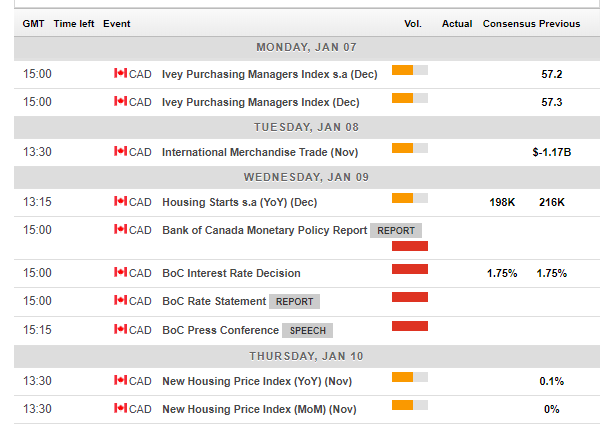 The central event is the rate decision by the Bank of Canada on Wednesday. When the BOC raised rates in October, it maintained the hawkish bias and seemed very optimistic about the situation. It was seen as a “hawkish hike,” and the BOC appeared to be on track for another increase in January. However, their December meeting was already much more cautious. Governor Stephen Poloz and his colleagues said that the economy has room for growth without creating inflation, a dovish twist. So, the BOC is set to leave the rate at 1.75%. Apart from the statement, Poloz and Senior Deputy Governor Carolyn Wilkins will meet the press after the decision and will also publish new forecasts for inflation and growth. Given the global slowdown, will they remove their intent to raise interest rates? Or will the Ottawa-based institution remain upbeat about the economy which continues growing? After the ISM Manufacturing PMI badly disappointed, the Non-Manufacturing version may suffer as well. This time, it is published after the NFP, thus not serving as a hint towards the jobs report. 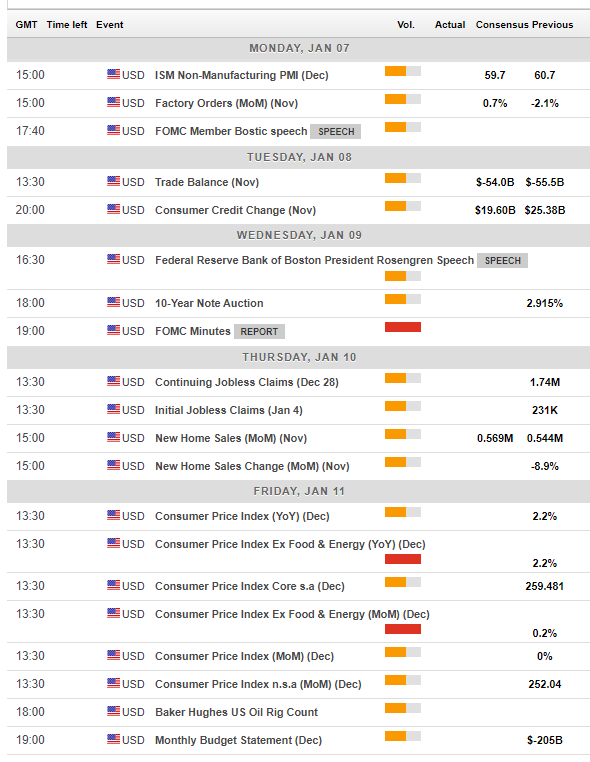 Trade balance and consumer credit are due on Tuesday, but a more significant event is expected on Wednesday. The Fed releases the minutes from its December meeting. Just before Christmas, the Fed raised rates but lowered its forecast for 2019 from three to two increases. However, markets had expected a more substantial downgrade. Also, Fed Chair Powell’s comment on continuing the balance sheet runoff, aka QT, on autopilot, also weighed on stocks. The minutes may reveal more data on how the world’s most important central bank sees the current situation, at home and abroad. On Thursday, new home sales will be eyed amid recent weakness in the housing sector, but markets may await Friday’s top-tier indicator. Core inflation ticked up to 2.2% YoY in November, a healthy rate. Will they maintain the current level? Headline inflation will likely slide from 2.2% due to falling energy prices. Political events should also be eyed in the US. 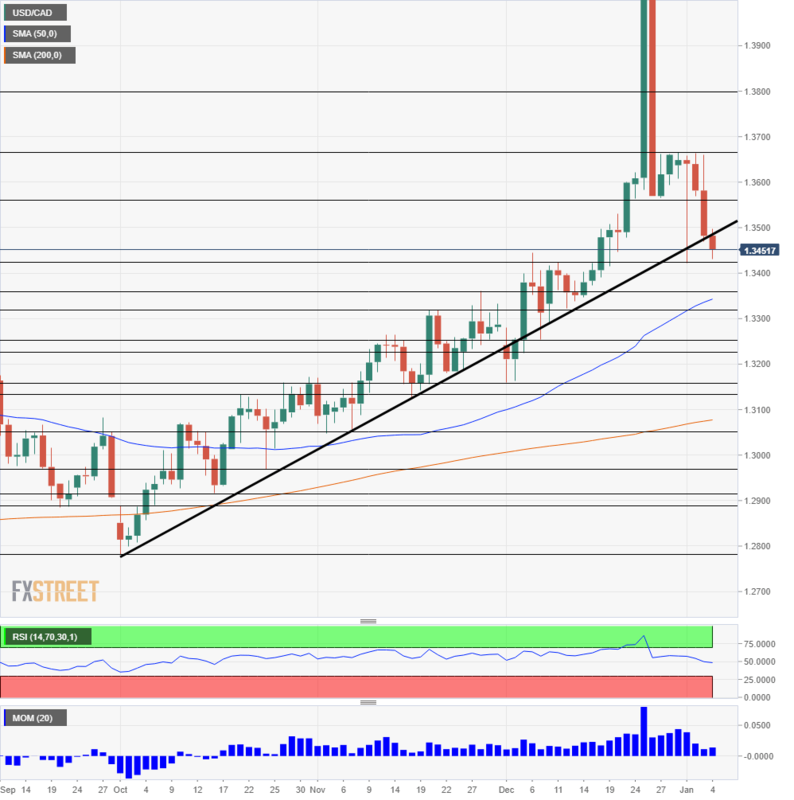 Dollar/CAD is dipping under the long-term uptrend support that accompanies it since October 1st. A breach of this line in early December seemed temporary. Will this one prove decisive? The trend remains bullish as the pair holds up above the 50 and 200-day Simple Moving Averages. The Relative Strength Index is balanced. Resistance awaits at 1.2650 which served as support around Christmas. 1.3665 was a stubborn cap at the turn of the year. Higher above, 1.3800 is a round number and also held $/CAD down in April 2017. 1.4000 looms above. The surge around the holidays can be ignored as it came amid very low volume. 1.3430 was the low point in late December and also worked as resistance earlier in the month. 1.3360 was a high point in November and 1.3250 was a stepping stone on the way up around that time. 1.3170 is the next line to watch. If the BOC maintains its bullish bias amid the global storm, the loonie has room to rise. Assuming no crash in oil prices and no hawkish twist from the Fed, the C$ has room to rise and Dollar/CAD may fall. The FXStreet forex poll of experts provides further insights.